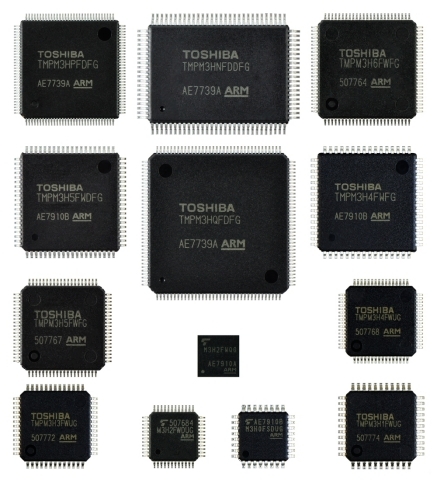 Toshiba Electronic Devices & Storage Corporation (“Toshiba”) has added the “M3H Group” to its “TXZ™ Family” of Arm® Cortex®-M-based microcontrollers for consumer and industrial equipment. The new microcontrollers are now in mass production. The M3H Group has two groups based on their functional level. “M3H Group (1)” offers standard functions, while “M3H Group (2)” offers an expanded package line-up and memory size and supports high-speed processing (80MHz). Together, they offer a rich line-up with 13 packages (32 pins to 144 pins) and flash memory ranging from 32KB to 512KB. The M3H Group is based on the global standard Arm Cortex-M3 core designed for motor control and to meet diverse requirements for consumer and industrial equipment. Operation frequency is up to 40MHz for M3H Group (1) and 80MHz for M3H Group (2). In addition to high-precision analog circuits, including a 12-bit AD converter (up to 21 channels) with 1.5μs conversion speed, and an 8-bit DA converter (2 channels), M3H Group (2) incorporates Advanced-Programmable Motor Driver (A-PMD), Toshiba’s motor control technology for inverter motor control of brushless DC motors. A-PMD realizes low power consumption and advanced functions, while incorporating highly versatile peripheral circuits, such as UART, I2C, TSPI and timers, and supports high-end home appliances and large-scale systems. A built-in self-diagnosis function that checks a reference voltage in the AD converter, a RAM parity function to detect errors during memory reads, and a CRC calculation circuit, all contribute to reduced loads in software processing. Toshiba plans to release groups of microcontrollers for communications control for high-speed data processing, and devices equipped with high-precision analog circuits for control of low- to medium-speed motors. The Company continues to expand the TXZ family to meet the needs of the motor control and global sensing market. Air-conditioners, washing machines, refrigerators, office automation equipment, housing and facility equipment, audio-visual equipment, motor control applications (consumer and industrial applications). Based on the de facto standard Arm Cortex-M3 core. A wide line-up of memory and package variations covers application in diverse products. Applications include main control of consumer equipment and motor control of consumer and industrial equipment. AD converter, DA converter, A-PMD, UART, I2C, TSPI, and timers are implemented. and electrical characteristics for each product group. Details of built-in functions (IPs) of products. evaluation board through actual operation. Video clip A video introduction to evaluation boards.